This new section of World War I Bridges indexed as "Animals" tries to get a glimpse of animal life during the Great War starting from a briefly commented image. We may find animals at the front, behind the lines or even flying over the no man's land. This is a painful side story of the Great War. The World War I bridge we could build again is thus the one between men and animals during the war time. In the above picture you recognize a German soldier equipped with a gas mask. Beside him, you see two dogs wearing probably the same type of mask he wears. Men and animals in the trenches share the same destiny and the same dangers. Here we are probably at a first stage of the development of these masks. 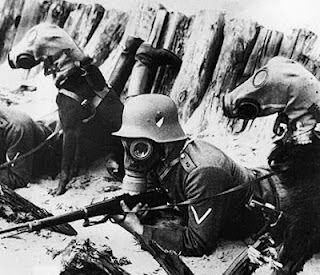 During the Second World War we may discover dogs equipped with gas masks likewise. It is interesting to know that, due to the increasing importance of dogs in war operations, the belligerent countries developed customized masks for them.